The RF-Lite is a simple, low-cost offline coding system; ideal for companies looking to automate their date marking process for the first time. 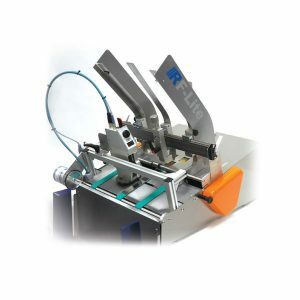 It also suits larger operators who are looking to install dedicated marking systems on multiple production lines. Fitted with clean, thermal inkjet technology, the RF-Lite is ideal for printing clear, concise date and batch codes onto sleeves and cartons. The RF-Lite can consistently print codes onto all shapes and sizes of sleeve ranging from 30 x 70mm to 300 x 200mm. It only takes a few seconds to swap between sizes. With its comparatively low upfront cost, the RF-Lite is an ideal entry-level solution for companies wanting to automate their offline date coding. It’s easy to set up and adjust; no training needed. The RF-Lite’s tiny 500 x 500mm footprint means that it can be easily squeezed into tight spaces. We offer a money-back guarantee if the system does not meet the customers needs and expectations. Under our one-year warranty we can replace a broken down RF-Lite unit within 24 hours.